Get a little wet to put the sneak on specks. 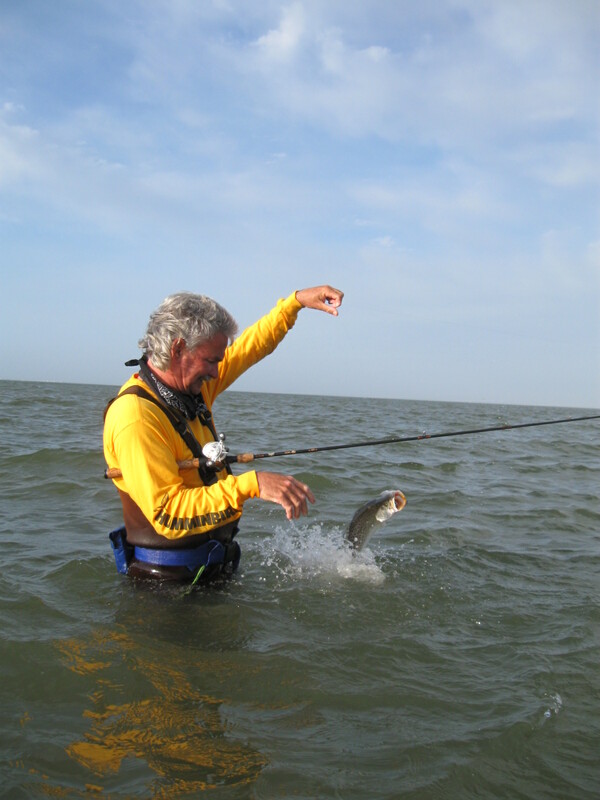 Here are some things you need to know about wade fishing for speckled trout! With the water temperature in the mid 60-degree range, it was going to be a little chilly at first easing in with no waders on. I was pretty sure, though, that after a few minutes, I would be unaware of said chill. The big advantage of wade fishing is stealth. Therefore, I directed my charter clients this morning to ease into the water as well and quietly move along while casting. “Keep moving as you cast and if you get a bite, stop and make several casts before moving on. During the early spring, the fish are in spawn and gather in large schools, so if you find one, usually you have found a bunch. Fish them smart and you’ll have a heckuva morning.” were my final instructions as we began to fan out. As we spread out, I kept my eye on them while also trying to properly work my own topwater plug. My head was turned when I got my first bite and I heard it rather than saw it. The big speckled trout had crashed my topwater plug and luckily for me – and unluckily for him – he hooked himself. After a couple of minutes, I was able to ease the nice trout up to me and slip the rubber-lined net under it. I admired the silver and pink hues on the fish for a second before releasing it and watching it swim off. Before lining up another cast, I checked on my crew and was pleased to see silhouettes against the early morning rising sun of two of them with bent rods and big trout loaded up on both. The next few casts to the end of the sandbar I was fishing yielded a couple more blowups with that many hookups. We eventually got pretty spread out so it was not until I went back and got the boat to pick them up, that I learned that all three of the crew had enjoyed a very good morning of wade fishing for speckled trout. 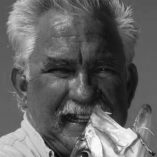 Each of them landed a dozen or so large speckled trout using a variety of topwater, suspending and slow-sinking plugs. A good trip, no doubt, but not uncommon for a wade fishing trip during the early to late spring. Although I enjoy all types of inshore saltwater fishing, none gives me more pleasure than being in the water while fishing. There is just something about being at eye level with the fish as they strike or just the quietness of being on an isolated stretch of beach catching fish as the sun rises. Not only is wade fishing an enjoyable way to fish, it can be very effective at certain times of the year – even more so than being in a boat. On windy spring days, the beach offers protection from the wind and clearer water. A slappy boat in two feet of water will kill any chance of catching quality fish. This is a classic case of where wading will be much more effective than fishing out of the boat. During the early to late spring, water temperatures on the northern Gulf Coast are in the mid to upper 60-degree range. At these ranges, speckled trout have begun their spawning ritual. They are also very active in shallow water all throughout the day. These are two key components for successful wade fishing for speckled trout. 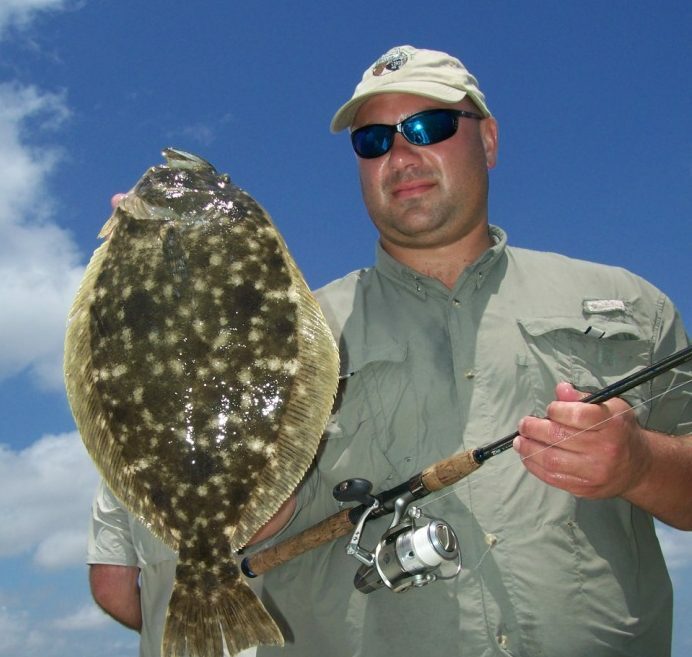 Many areas throughout the Mobile Bay system offer very good wade fishing. Some of my favorites are both sides the west end beach of Dauphin Island from Katrina Cut to the very west end, the Sand Island peninsula, Dauphin Island Bay, the shoals by the Dauphin Island Bridge, and all of the beaches from Heron Bay to Grand Bay on the north side of the Mississippi Sound. Some of these areas are even accessible from land, which means you don’t even have to use a boat to get to them. Frequently during the spring, the wind direction and velocity determine where I wade fish. For example, if there is a strong wind with a southerly component, the Mississippi Sound side of the west end beach is awesome, but a northerly wind makes it unfishable. In that case, I usually head towards the north side of Portersville Bay or Grand Bay. The key is to make sure that you are wading in the wind always at your back and over your shoulder. This allows for more stealth and longer casts. On the subject of stealth, I preach to my clients to just glide through the water. The fish can feel and hear very well. Keep in mind that you are going to be in very shallow water. The other thing that moving slowly does is give the dreaded stingrays time to move out of the way – and they will if you give them time. Also, most of the time, the biggest concentration of stingrays are right at the shoreline so be extra careful when getting in or out of the water. The key, though, is to move in order to cover ground. It doesn’t do any good to jump out of the boat and stand right next to it while casting. You may as well just stay on the boat if you are going to do that. When wading a vast area like the west end of Dauphin Island with a group, I like to “leapfrog” to cover ground. In this situation, I drop one or two people off, move the boat down the beach in the direction of the wade and get out. When the first group gets to the boat, they jump in and leapfrog us by going down the beach a quarter mile or so and jump out. We will continue this until one group hits the fish. At that point, we regroup and go to work on the fish. 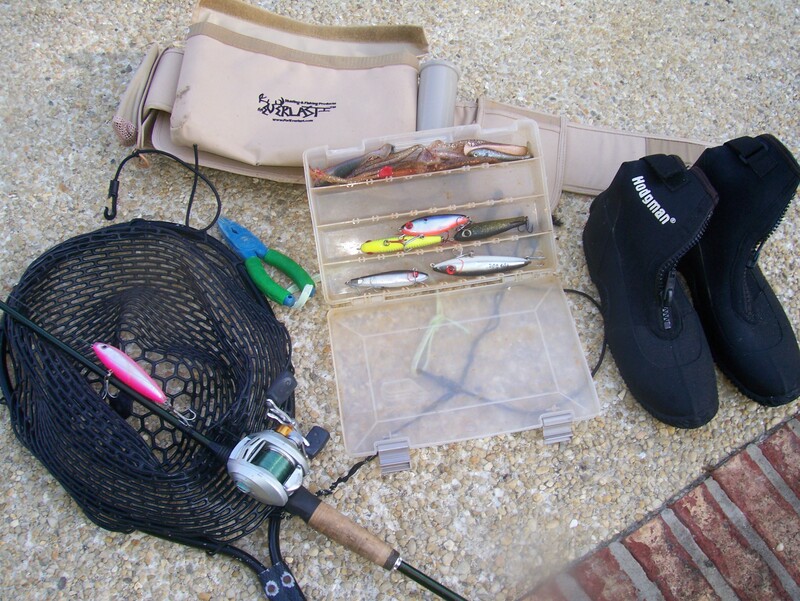 My wade fishing gear is fairly simple since I don’t want to be lugging a bunch of unnecessary junk along with me. It’s easy to carry in the water, but remember, at some point, you have to hump it all back to the boat. My wade fishing rods are 7-foot medium- to medium-fast casting rods with Abu Garcia Revo STX SHS reels. I use 10-pound-test Berkley Trilene XL monofilament line on them. These setups allow for insanely long casts. Whatever rod and reel you decide to use, be sure that it is reliable and you can cast it well. There is nothing more frustrating than being on a group of fish and have problems with a reel. You’ll always be a long way from the boat when that happens. My wade fishing belt includes a minimum amount of lures, just a couple topwater plugs, sinking plugs and some grubs. Carry a set of pliers. I like the plastic floating type because they don’t rust and are easy to get to when I have a fish on. I keep a rubber mesh net on my belt too. It makes landing a big trout with a topwater plug in his mouth much safer. The rubber is also tangle-free and doesn’t rub the slime off the fish when they are netted. I very rarely keep fish, but if you are planning to keep some, be sure to add a stringer to your wade belt. An old pair of tennis shoes will work fine as wade shoes, but be sure that they will stay on your feet if you get into some soft bottom. I like rubber wading boots with a zipper. They stay on tight and do a very good job of keeping sand and shell out. Just about any types of pants work well to wade in while you are in the water. The goods ones, though, are the ones that are comfortable when you have to make a long walk back to the boat. It’s money well spent on a pair that feels good when wet and dries quickly in the event you are going to be fishing out of the boat later in the day. Although my main target species on most wade fishing trips is speckled trout, it’s not uncommon at all to stumble upon other species. Of course, redfish inhabit many of the same areas as trout but don’t be surprised if you catch flounder, Spanish mackerel, and ladyfish. I’ve even hooked a couple of tarpon! I’m often asked what my largest speckled trout is. To date, it is a 31-incher that I caught in 2001 while wading the west end beach on my wife’s birthdays, April 25. When you list all of the advantages of wade fishing for speckled trout, especially during the spring, it’s hard to imagine not doing it at some point. I hope that if you decide to give it a try you’ll be successful using some the tips that I have presented.